In using the expression 'poetization' in this context the teacher becomes a poet. 'Poesis' originated in greek, in connection with 'creativeness'. Poetization starts when one takes part in a creative process, coming into touch with life itself. To poetize means grasping the whole essence. The birth of originality comes with the artist. 'Originality' is derived from the Greek word 'poesis' which Plato and his contemporaries used to mean 'something where before there was nothing' - 'ex nihilo'. Plato also used the term 'poiein' (poetry = 'making'). Originality and the sense of the unique makes a sudden appearance there where before was nothing. The method was revived by the Romantic poets of the 19th century. Wordsworth once said: 'The poet is a teacher and the teacher is a poet'. 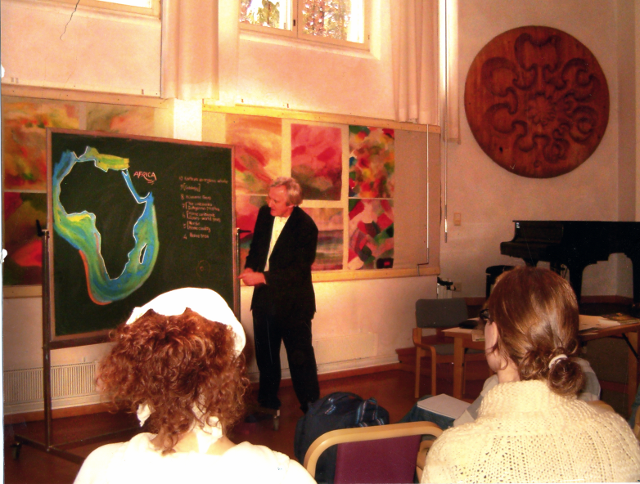 Co-founder, and holder of the position of associate professor, of the Rudolf Steiner University College in Oslo - an independent, state-funded teacher education institution. Co-founder of the Skola za sutra in Zagreb and the Sola Zivlenja in Ljubljana (where he is the pedagogical leader). Project Leader in Innovation in Education at the Ministry of Education and Sport (Ministrstvo za Izobrazevanje in Sport), Republic of Slovenia. Member of the Botin foundation Platform for Innovation in Education in Santander, Spain. Consultant for commercial enterprises who are interested in reforming educational practice, in tune with the contemporary need to nurture competences based on human values at primary, secondary and tertiary levels. Researcher into these topics and author of several books. Guest lecturer at a number of universities and teacher education institutions (mainly in Croatia, Italy, and the Balkans) in resilient methodology and applied creativity. Holder of master classes in methodology in teaching youths, as well as in Geography and the Social Sciences. Mali Roald (Painting). Diplomas from the Academy of Art, Bergen, Norway and Malschule am Goetheanum, Switzerland. Is a practicing artist and has 14 years experience as art teacher in upper schools in Norway. Lecturer in art Rudolf Steiner University College Oslo. Hosts regular courses for teacher and art students in Norway, Sweden, Italy and Slovenia. Dag Aslaksrud (Drawing). Diploma Architect from the Academy of Art, Oslo. Class teacher and art teacher, 25 years experience. Leader of courses in Norway, Slovenia and Italy.